When I spoke to Petbrosia’s founder and CEO Keith Johnson earlier this year, I asked him many questions about Petbrosia, but one I knew would be important to dog and cat owners everywhere: Does Petbrosia taste good? Johnson chuckled and then urged — no, dared — me to try his pet food out on the pickiest of my three dogs. Johnson’s challenge made my choice an easy one. My Shiloh Shepherd Lily is a vacuum cleaner and will literally eat anything, and Mia, my Pit Bull Terrier, will munch on almost anything. But my Shih Tzu? Well, Mushie is like the mean food critic in the movie Ratatouille who every restaurateur fears. To say Mushie is a picky eater is an understatement. 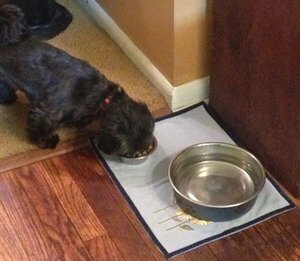 Friends usually get a kick out of watching my persnickety Shih Tzu literally comb through her food bowl, sifting out each individual kibble, evaluating it closely before either carefully munching it down or, as is most often the case, using her tiny paw to literally kick it aside. Mushie always has her “quality control” meter turned up to eleven, and if the food doesn’t meet her high expectations it goes nowhere near her discerning taste buds. Now, to learn Mushie’s story is to understand why it is I am such a watchdog when it comes to what she eats. Mushie became mine for one simple reason — she was a foster failure. After she and 50 or so other matted and sick small dogs were rescued from a puppy mill in 2010, Mushie was one of the lot who came to live at my house for some much-needed TLC. Years of neglect had left her hair too long, too scraggly, growing into her face and leaving her eyes covered in ulcers and thick, visible scars. Her vision cloudy at best. The “Blend Overview” includes details on what went into the pet food and eating instructions. The little mop-top was a meager four pounds when she came to me from the puppy mill. Right away I noticed Mushie’s stomach was constantly growling, and even as she started eating the expensive organic brand-name food I’d bought for her and putting some meat on her bones, that growling never seems to stop. Even now, more than three years since I made her mine, and as many years of constantly monitoring her food intake, her stomach can still sound like an angry werewolf from across the room. After countless visits to the vet, I’ve learned Mushie has a nervous stomach, complete with a wicked case of acid reflux, bad breath, and excessive, often painful gas (hence the loud tummy noises). Luckily, in the years since I added her to my pack of misfits, frequent grooming and veterinary intervention have done wonders for Mushie’s eyes. Her vision has drastically improved, and many of the scars left behind have faded substantially. There will probably be a little bit of residual cloudiness there for the rest of her life, but I do what I can to make the best decisions for Mushie’s eye health — including making nutritious food and treat choices — and keep that cloudiness to a minimum. Providing the best nutrition possible for Mushie has always been my top priority, especially since she spent her first two years eating garbage in a chicken-wire crate. When I started learning more and more about Petbrosia and their dedication to creating the most nutritious food formula possible — and customized for every pet to boot — I was intrigued. 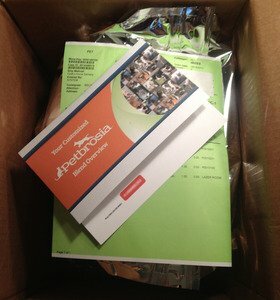 Ordering and receiving a delivery of Petbrosia food is a unique experience. As someone who has purchased everything from puppy sweaters to 50-pound bags of dog food from various e-commerce sites in the past, Petbrosia is in a different ballpark altogether. The first step in the Petbrosia process is to hop on their site and do a little bit of research. One of the things I have come to really appreciate is how much information the company provides about the ingredients in their food. No by-products, no corn, no soy, no wheat, no nasty fillers, no questionable preservatives, unnatural synthetic dyes, artificial colors or flavors? Check. Antibiotic and hormone free? Check. Produced in the U.S. only? Check. Vitamins and minerals from natural sources? Check. If transparency is important to you when choosing which dog food company gets your business, then Petbrosia wholeheartedly gets my seal of approval. While every formula varies slightly, depending on each dog’s nutritional needs, it made me feel confident as a pet parent to carefully read about each ingredient and its benefits before clicking the “Order” button. Only two days after I placed my order, the Petbrosia box was waiting on my doorstep. On top of the 20-pound bag of kibble was Mushie’s customized “Blend Overview,” a thorough rundown of the ingredients that went into making the bag of food Mushie would be eating for the next six weeks or so. The “Blend Overview” also includes feeding instructions — Petbrosia kibbles seem a bit denser than the run-of-the-mill brand, so you must pay close attention to instructed food servings or risk making your pup too plump. Though I’ve only switched brands maybe two or three times since adopting Mushie, I know from experience my Shih Tzu’s nervous stomach does not like change. Within the first two weeks, as I transitioned Mushie’s meals from her old brand name food to Petbrosia, carefully mixing the new kibble with the old, I was instantly impressed. While changing up her food in the past caused Mushie’s bowels to revolt, leaving my poor Shih Tzu lethargic, the Petbrosia actually seemed to calm her stomach down. How did my finicky Shih Tzu take to Petbrosia? She loved the taste. No more having to get a broom and dustpan to sweep up the bits and pieces of dog food Mushie typically leaves in the “reject” pile. When it’s dinnertime, Mushie is ready and waiting at her food bowl — and her sisters, Lily and Mia, are too. I think my big dogs, who are still on the brand-name dog food, are quite jealous of Mushie’s Petbrosia kibble, as they have both managed to sneak quick bites when Mushie isn’t looking. When I first ordered Petbrosia, I never could have expected what a noticeable shift I would see in Mushie’s overall health. Weeks after shifting her diet completely to Petbrosia kibble, I have noticed her breath is much less stinky, and she’s even come off of her acid reflux medication — a feat I never thought would be possible. I don’t know if it’s just my imagination playing tricks on me, but Mushie’s eyes seem even clearer since I started her on her Petbrosia meal plan. Needless to say, when the last of Mushie’s Petbrosia starts to run low, I will be ordering another bag — and likely filling out Pet Profiles for Lily and Mia, too. Petbrosia is one of the pricier dog food options out there. A 20-pound bag is more expensive than many of the other organic brand-name dog foods I’ve tried. Including the cost of delivery, one shipment of Petbrosia for my Shih Tzu cost more than $60. But, at least in this case, when you purchase Petbrosia you really do get what you pay for. Not only is it full of quality, all-natural American-made ingredients, giving me peace of mind and Mushie the kind of nutrition she really needs, but because she loves the taste of Petbrosia I feel as though I can get my money’s worth with every bag. When I think about all those kibbles Mushie deemed unsatisfactory over the past three years, every small pile of high-quality brand name pet food that I had to sweep into a dustpan, I realize that a good portion of every bag I bought went uneaten. On the contrary, Mushie gobbles up her bowl of Petbrosia, down to the last kibble, every time — absolutely no food or money from my wallet wasted. Plus, as long as I follow the feeding guidelines on Mushie’s “Blend Overview” sheet, her portions stay appropriately small, meaning one bag of Petbrosia should last her six weeks or more. Bottom line: If you’re a pet parent looking for what could be the next great innovation in pet nutritional health, someone who is sick of what Keith Johnson calls “the one-size-fits-all” approach of the typical brand-name dog and cat food, give Petbrosia a try. Believe me, if Mushie approves, your dog will, too. PROS: Offers nutritious and tasty premium kibble delivered to your door at super-speed; food formula is customized for your dog’s — or cat’s — specific needs; company is extremely forthcoming about food ingredients; customer-friendly process. CONS: Food is a bit on the expensive side.